This NUFC player has been like a man possessed since Miguel Almiron’s arrival… – NUFC blog – Newcastle United blog – NUFC Fixtures, News and Forum. A lot has been said about Ayoze Perez following Saturday’s stunning win over Everton – and rightly so. The Spaniard inspired us to an incredible second half comeback, notching two goals and an impressive assist, and the fact he’s looked a player re-born since the arrival of Miguel Almiron can’t be ignored. It’s no coincidence. I must admit, he was bordering on anonymous in the first half on Saturday – and was a regular source of frustration in early season games at St James’ Park – but that quickly changed – and that’s Ayoze Perez in a nutshell. Personally, I only get so annoyed with Perez’s poor games because I know he’s capable of what he did in that second half vs Everton. Even his work rate. He constantly tracks well and picks up good defensive positions, but he’s been like a man possessed at times over the past month, winning headers he would’t have even contested a few months ago and getting his body between man and ball and battling, instead of just bouncing off opponents and falling over. The understanding he’s built with Salmon Rondon has helped him massively (similar to the partnership he built with Mitrovic at one point), but he’s sparked into life since we got Almiron. If you look back on all of Perez’ goals or assists, they’ll have been instinctive, first time and done naturally without much thought. 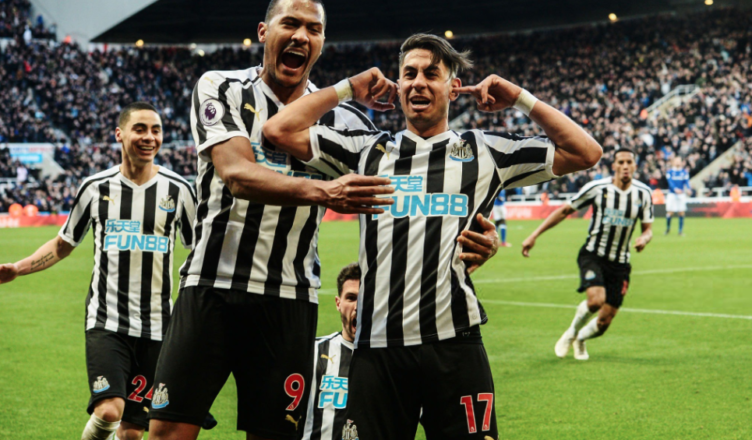 Fluid football suits him – and Almiron’s arrival (combined with the fact he and Rondon are becoming telepathic) has made us much more dynamic; and Ayoze is thriving. Both Almiron and Perez have a bit of freedom to pick up pockets either side of Rondon, with our advanced full backs meaning they have options both in field and out wide. It’s now become a theme that fans get slated for slagging off Perez – which is fair enough given how he’s always delivered at the business end of the last three seasons – however it can’t be ignored that he was poor earlier in the season. But guess what? So was Rondon and so was Lascelles, with few having much good to say about Schar or Ki at that stage too. We’ve come on leaps on bounds as a team as the season has gone on. The test now will be consistency for Perez. Now we appear to have found a system that suits him down the ground, let’s hope we can see him deliver the goods week in week out. Rafa has been building a team that can both defend and attack, he has got the 7th best defence in the league, a basis of a more than decent midfield and now 3 players up front in Robdon Perez and Almiron who are showing signs of being a really good and quite possibly a great partnership. Yes there is a different buzz up front since Almiron arrived, he give Perez that space and freedom he hasn’t had before.